Why choose Bella Pelle for your Laser Hair Removal? Laser treatment for unwanted hair is a non-invasive approach to permanent reduction and long-term hair removal. 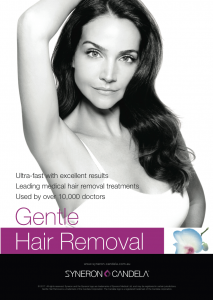 We use a Candela GentleLase PRO, which is FDA Approved, CE Approved and TGA listed as highest grade medical laser with gold standard wavelengths 755nm light for treatment of unwanted hair, benign pigmented lesions, vascular lesions and wrinkle reduction. Our Laser Specialists are fully qualified, certified and trained laser therapists. ‘OMG, FINALLY A PAIN FREE LASER’: We have a Dynamic Cooling Device fitted onto our laser machine making it the most comfortable laser on the market. You literally feel like cold gas is being sprayed onto your skin! You will experience no downtime & large areas can be treated quickly and effectively due to our larger spot size options. We can also treat most skin types, and most hair colours, unlike older or inferior lasers which are limited to light skin colours and dark hairs only. 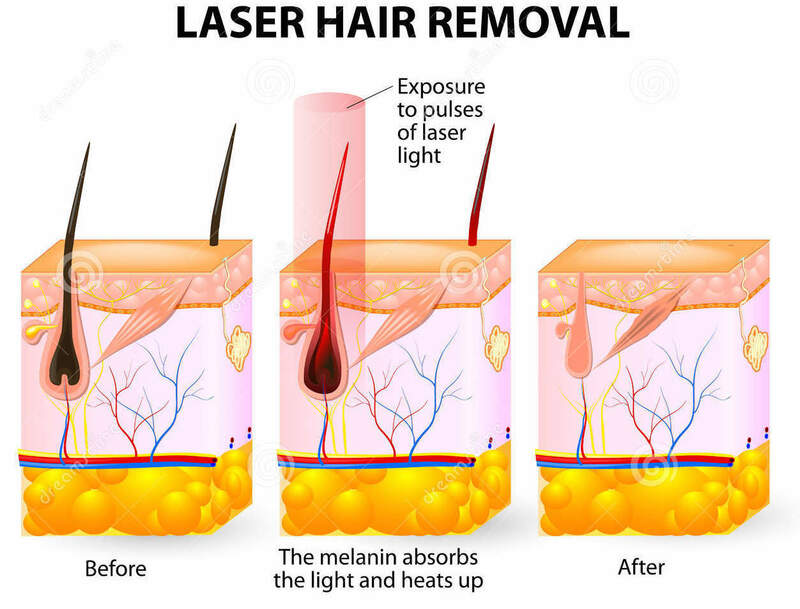 Laser light targets the pigment in the hair follicle. Heat is absorbed and destroys the cells lining the hair follicle specifically around the bulb, bulge, and vascular supply, enabling the hair to grow back. 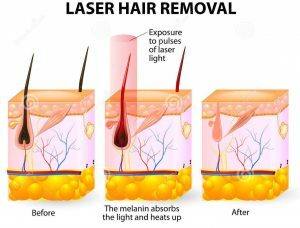 Laser hair removal affects hair follicles only when they are in the Anagen or growth phase. This means more than one treatment is necessary to disable hair follicles that subsequently enter the growth phase. You will need at least 3 treatments of laser to see complete result. Or within 7 days of when re-growth is observed. 1) For best results, multiple treatments will be needed. 2) For most areas 4-6 treatments are necessary to achieve desired hair clearance. 3) One may need more or less than 6 treatments depending on hair type, previous methods of hair removal, and skin colour. 4) Results may vary from patient to patient and to various degrees of efficacy. Why do I need a Skin Screening? to identify the area to be treated and advise you how to prepare the area before treatment. to assess if the Gentlelase treatment is appropriate for you. No spray tanning, sun tanning or excessive sun exposure at least two weeks prior to treatment. No plucking, waxing, tweezing, epi-lady for 6 weeks prior to treatment. Cold Compresses may be used to reduce patient discomfort and edema. Post Laser Gels must be used to help with healing. No plucking, waxing, tweezing, epi-lady for 6 weeks after treatment or at all during your course of treatments. No sauna’s, spa’s, exercise, heating up of body or skin for 24 hours post laser. To get the best possible price for your laser treatments, it is compulsory to have a skin screening and consultation with one of our laser specialists. We charge on laser time not area as we find this is the fairest way for the customer as not all people’s hair growth areas are exactly the same size, so why should you pay the same price? We also have the fastest laser on the market, so most areas take 5-10 minutes max, and most people only need about 4 treatments! A list of cost per minutes are below however keep in mind that this is just a guide and the more minutes/areas someone needs the cheaper the rate will get therefore an accurate price needs to be given to each individual.